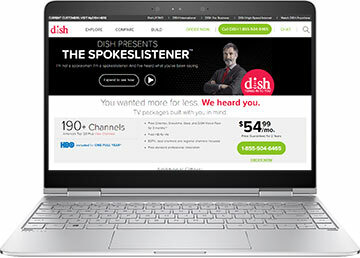 This page lists all the latest Dish Network deals, so you can save on TV packages, high-speed internet, and other services. Whether you are looking for the cheapest plan possible or want a discount on a complete satellite TV package with HBO, Showtime, Cinemax, and Starz, we compile the best Dish Network deals and coupon codes on this page. If you want to compare satellite TV to other options, build your own package, or order satellite TV, head on over to dish.com. They list current package deals for Satellite TV and high-speed Internet bundles. Promotions constantly change, but options sometimes include free HBO, Showtime, Starz, or Cinemax, free HD, or free professional installation.